What is the Juvéderm Volite Beauty Booster? Juvéderm Volite is injectable Hyaluronic Acid part of the Juvéderm family products. We call this treatment a beauty booster because, unlike other Hyaluronic Acid fillers, Volite does not create volume in the skin. 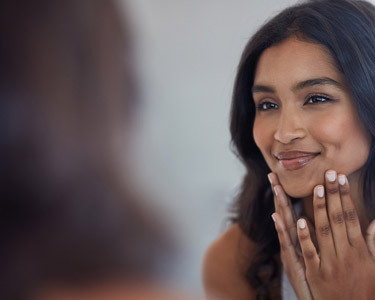 Rather, it provides an overall boost of hydration and glow while addressing certain kinds of fine lines that cannot be corrected with Botox or volume fillers (for example fine lines that appear after smiling). Your skin will be more hydrated, smoother, and will have a distinct “glow” to it. How is the Juvéderm Volite Beauty Booster Performed? Your nurse injector will administer the product via many fine needles throughout the skin, which delivers the added benefit of a micro-needling treatment. These micro injuries to the skin help to produce collagen and elastin, further improving the skin’s look and feel. A topical numbing cream applied prior to your treatment ensures that you experience minimal to no discomfort. Who are the best candidates for the Juvéderm Volite Beauty Booster? Anyone who is looking to improve hydration, glow, and skin elasticity is a great candidate for this treatment. In addition, if you notice fine lines that don’t seem to go away after you smile, Volite will absolutely improve that. We want you to avoid anything that typically causes bruising for 1-2 days pre and post your treatment. Avoid aspirin and non-steroidal anti-inflammatories like Advil, if you can. Certain supplements like Vitamin E, fish oil and St. John’s Wort have been known to increase the likelihood of bruising. Limit alcohol intake as well, as it too, can make you more prone to developing a bruise. Your treatment provider will discuss these preparations in more detail when you meet for a consultation. You will notice an improvement in your skin immediately. You may notice tiny bumps where the injections were made for 1-3 days post treatment. These can easily be concealed with makeup, and we can recommend a concealer for you that we carry at the clinic. Some individuals may bruise but bruising tends to be minimal. Your results will continue to improve in the days following the treatment, with your full results being apparent within 2 weeks. How much does the Juvéderm Volite Beauty Booster Treatment Cost? This treatment is between $1200 and $1800 and lasts 9 months.